What Hotel Chain Is Continuing Its Expansion In Asia? Bangkok, Thailand, August 11, 2016 /ChinaNewswire.com/ - AccorHotels announces the further expansion of its partnership with Destination Resorts Company, Limited to manage ibis Styles Samui Chaweng Beach, scheduled to open in early 2017. Located in the heart of Samui island's entertainment and nightlife attractions, in the same development as Hard Rock Cafe Samui and adjacent to the lifestyle shopping complex Central Festival Samui, the trendy resort will be a focal point for stylish, young-at-heart travellers seeking fun and excitement. The resort will also be a two-minute walk to Chaweng's white-sand beach and a 10 minute drive from Samui International Airport. Guests of the 129-room ibis Styles Chaweng Beach will enjoy the latest design and technology offerings, with an accessible room rate inclusive of breakfast and internet access. The resort's ground-floor bar, lobby, and market-style restaurant will encourage social interactions, while the swimming pool and rooftop bar will offer iconic selfie moments. “The ibis Styles ‘all inclusive' concept and promise of simplicity, generosity, quality and conviviality stand apart, particularly as an economy brand, and resonate with the increasing number of travellers in Thailand and on Samui, especially young domestic and intra-Asian guests,” said Mr. Patrick Basset, Chief Operating Officer for AccorHotels Upper Southeast and Northeast Asia. Within Thailand and Asia Pacific, ibis Styles is one of AccorHotels' fasting growing brands. It is a non-standardised economy brand offering stylishly-designed hotels “where the little extras don't cost extra.” Catering to business and leisure travellers and situated in city hubs and other major centres of activity, each establishment has its own distinct personality and reflects a colourful, bright and energetic brand spirit with a hint of humour. There are currently two ibis Styles operating in Thailand, and the new resort joins five others in the brand's pipeline for the country, including ibis Styles Bangkok Sukhumvit 50, ibis styles Bangkok Khaosan Viengtai, ibis Styles Chiang Khong Teak Garden, ibis Styles Phuket Phokeethra and ibis Styles South Pattaya. Mr. Gary Murray, CEO of Destination Resorts, said, “We are thrilled to introduce ibis Styles into our portfolio with AccorHotels. The modern brand will complement our existing set of Novotel resorts located throughout Thailand, and appeal to the growing number of millennial travellers. 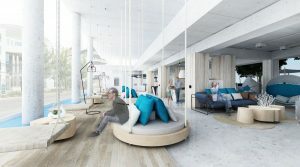 ibis Styles Samui Chaweng Beach will be the fourth property managed by AccorHotels in partnership with Destination Resorts, along with Novotel Hua Hin Cha Am Beach Resort, Novotel Phuket Karon Beach Resort and Spa, and Novotel Phuket Surin Beach Resort, which was recently rebranded in early April 2016. Ibis Styles Chaweng Beach will be located at 168/61 Moo 2, Tambon Borput, Ko Samui, Surat Thani 84320, Thailand.